The LEED Study Guide was created to help you pass the LEED exam the first time. The LEED Study Guide contains information about LEED certification, Integrative Strategies, Location and Transportation, Sustainable Sites, Water Efficiency, Energy and Atmosphere, Materials and Resources, Indoor Environmental Quality, and Project Surroundings and Public Outreach, USGBC, and GBCI. The LEED Study Guide will help you learn everything you need to know to get LEED certified buildings. 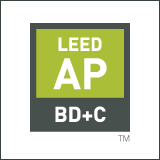 This course will provide a technical analysis of the LEED BD+C rating system, starting with a review of the project team and LEED certification process. We delve into the credit requirements, calculations, and synergies among credits for each of the eight credit categories. Hands-on exercises are included throughout. Learn how to get LEED certified projects. Course Prerequisites: General green building knowledge is required. It is recommended that the participant is a LEED Green Associate, and/or completed a course of study in green principles and the LEED Green Associate credential.